One tree can make millions of matchsticks, but one matchstick can also burn millions of trees. 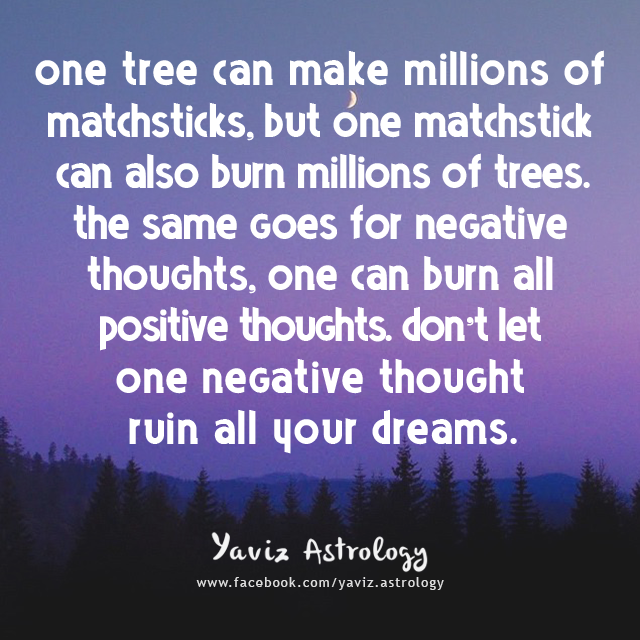 The same goes for negative thoughts, one can burn all positive thoughts. Don't let one negative thought ruin all your dreams. The Moon is back in her home sign of Cancer trining Neptune / Chiron in Pisces, and we are moved to be more receptive to our Divine inner guidance and to follow it without hesitation. It's a good time to keep our focus as we can be presented with the perfect opportunity to work on that one dream to bring it into reality. The Cancer Moon will oppose Pluto in Capricorn and square the North Node in Libra, and matters of the heart should not be allowed to get in the way of our work. Look around us and take note of all we see, it will help us to get a good perspective on what's truly going on in our life. There's something important we can learn from a turn of events that will show us what it really means to be disciplined while at the same time keeping our spirit of freedom alive. With the square to Uranus in Aries, do not let changes in our home or work area cause frustration or anger. Remember our positive side and keep focusing on that. Continue with the energy of persistence and our hard work can pay dividends by week's end. You'll be judged no matter what you do. Might as well be happy and do your thing. The Moon is in Leo along with Jupiter - which is now in retrograde, inspiring us to go with the flow and express our feelings about life, love and poetry. This can be a more exciting time for us, as more good memories will be made. The Moon in Leo is opposing Mars in Aquarius, and our energy serves us with strong purpose and peace of mind in inspiring and helping others. Just keep our head in the game so things won't draw our attention away from that which we are good at. With the trine to the Sun / Mercury in Sagittarius and Uranus Rx in Aries, our mind is alert, and our heart can tell when it's time to make things happen. Different situations and conversations will bring in new opportunities for opening more doors our way. We can make this time more beautiful simply by being ourselves, and allowing our creative side to come out through spreading some happiness around. Do the best we can to surround ourselves more with happy people, especially when things seem to get weird or out of control. As our confidence and energy level reach peak point, the more tasks we'll be able to fulfill, and the fun to come will make it all worth it. We could soon discover that we have a new flair to our way of doing things, this can spark new joy in us and bring a breath of fresh air into our chosen path. Lives fall apart when they need to be rebuilt. 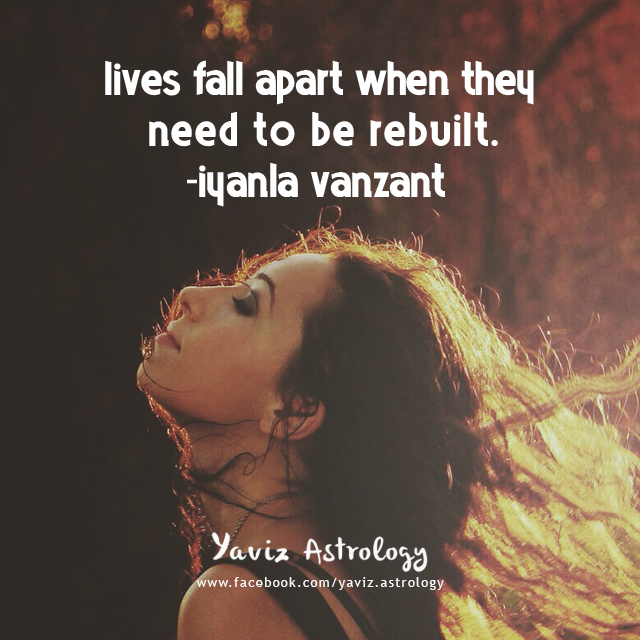 -Iyanla Vanzant (Virgo Sun) The Moon is in Virgo opposing Neptune / Chiron in Pisces, getting our intuitive feelings going strong. Our hopes and dreams can provide us with a lot of assistance at this time, especially at times when things seem to get a bit stressful. We are approaching the 6th exact square (a challenging aspect that began in 2012) between Uranus in Aries and Pluto in Capricorn, so there has been a lot of tension bubbling underneath, on an individual level as well as collective level. The Moon in Virgo is making a trine to Venus / Pluto in Capricorn, and whatever we have thought through can give us a sense of relief to keep going for our goals. It will be good to take a direct approach with a no-nonsense attitude. Anything we set our mind to can work out in our favor when we incorporate more love into our daily activities. 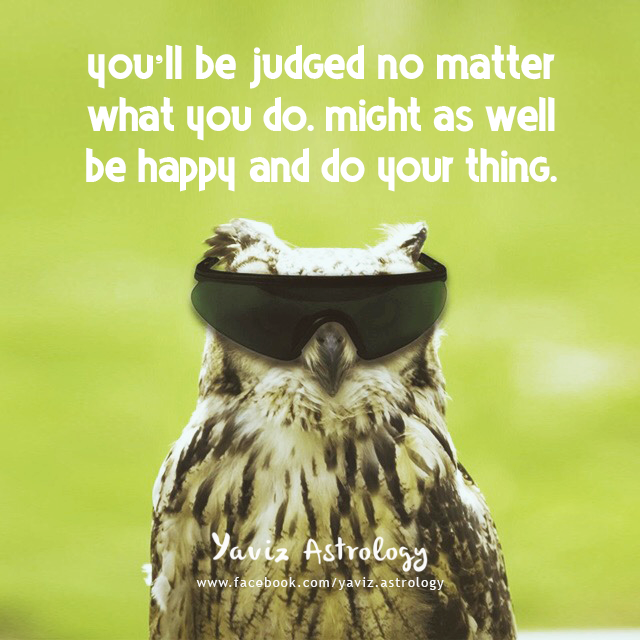 With the square to the Sun / Mercury in Sagittarius, make sure we don't get too opinionated so that others can understand more clearly what we have to say. Allow the strong energies to inspire our expertise and skills instead, and we will succeed in getting one step closer to our heart's wishes this month. By trying our best to stay centered in the midst of powerful changes, we will know exactly what to do at the right moment. Start new beginnings with new ideas, and wash the old with positive thinking. I think the Earth and everything around it is connected—the sky and the planets and the stars and everything else we see as a mystery. I think we connect when we accept that the mystery is also taking place here on the ground. 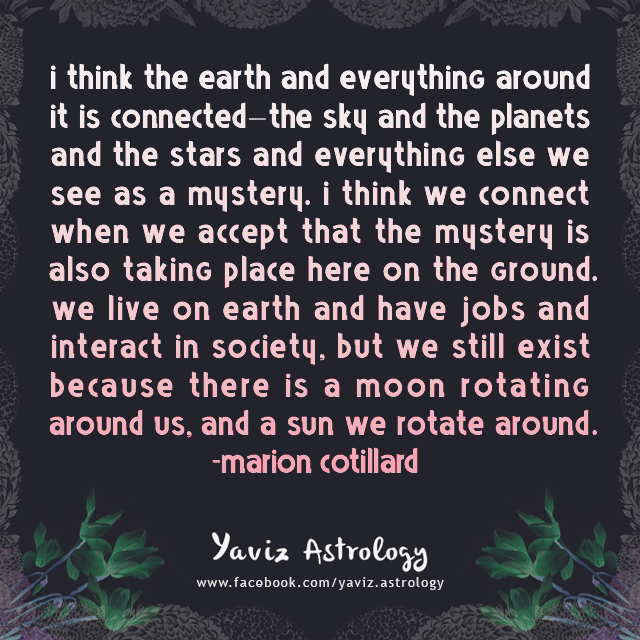 We live on Earth and have jobs and interact in society, but we still exist because there is a moon rotating around us, and a sun we rotate around. -Marion Cotillard (Libra Sun) The Moon is in Libra trining Mars in Aquarius, and we are at our best when we tap into our creative side. Inspirations can be found all around when we open our mind and listen to our instincts. Moved by the dynamic energy in the air, we're coming up with potential projects and new ideas, it's almost a problem to know exactly how to accommodate them all. Talk to friends or others who are on the same wavelength. Find out which they feel are most practical and need to be pursued, as their thoughts can help to complete the puzzle. With the Moon in Libra squaring Venus / Pluto in Capricorn and opposing Uranus Rx in Aries, we may get carried away at some point by insecurities about the uncertain nature of our relationships or the future. Instead of worrying, try to focus on the next small steps we can take in order for us to expand, evolve, and move past the fear. Release tension and the need to control and things will go better. The Libra Moon will sextile the Sun in Sagittarius and Jupiter Rx in Leo, and we catch a glimpse of a new hope on the horizon. Our mental energy is strong for big dreams so believe in them. Fill our whole body with joy and contentment, as we think about the blessings that surround us. Being alive and well, is cause enough to celebrate. With the exact square between Uranus / Pluto happening now, we may be anxious to change or move forward. This is a time of transformation. Things are changing, but they will do it in their own time. For now, let go and embrace the new journey. 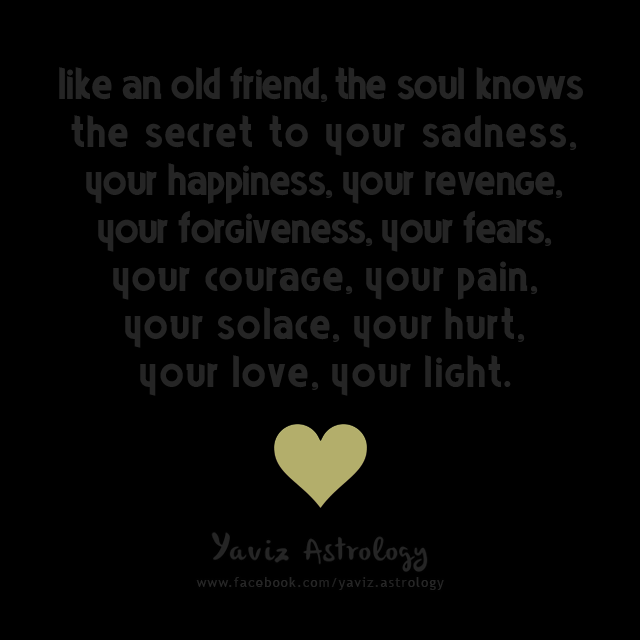 Like an old friend, the soul knows the secret to your sadness, your happiness, your revenge, your forgiveness, your fears, your courage, your pain, your solace, your hurt, your love, your light. The Moon is in Scorpio forming a trine to Neptune in Pisces, and our eyes open up more to the new dynamics taking place within. Feel free to go with the pull of our emotions. We could be surprised by how much we've grown mentally and emotionally, and we feel the motivation to keep going strong. The Scorpio Moon is sextiling Mercury, Venus and Pluto in Capricorn, and it's best to work on something that fascinates us or that we are passionate about. Communication with people will be good and interesting as our wisdom and alert mind is ready for anything that comes our way. We could end up having a deep meaningful conversation, and it turns out to be a new learning process. The energies are also wonderful for love, where matters of the heart can come to a new turning point. With the Moon squaring Mars in Aquarius and Jupiter Rx in Leo, it may take some work on the imagination to be creative, but we can get it right when we tune into what we're feeling. By restraining our ego from going over the top, what we thought was a problem could in fact be another blessing in disguise. Find a balance between work and rest, between the spirit and the body. Do not worry about the future too much. We are here to grow one moment at a time. Sometimes the best thing you can do is not think, not wonder, not imagine, not obsess. 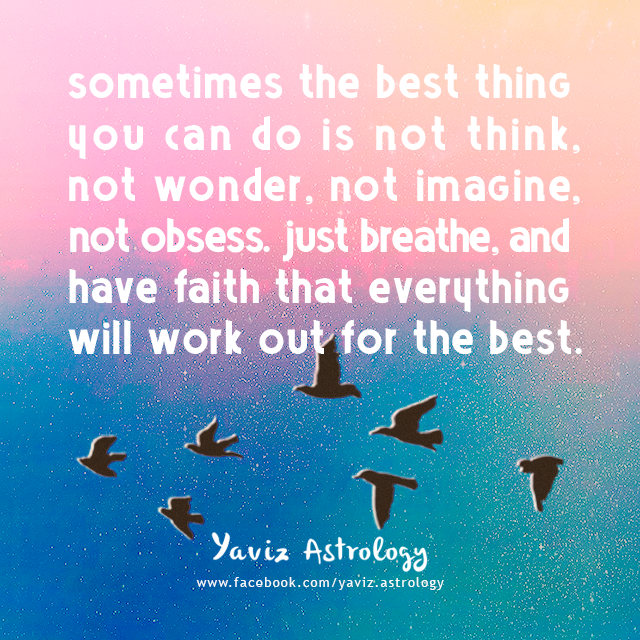 Just breathe, and have faith that everything will work out for the best. With faith, we can keep learning. With faith, we can keep on moving forward. No matter how many lessons we've learned, or how many moves we've made, we always have the chance to start again. The Moon is in Sagittarius sextiling Mars in Aquarius, and the new actions we take could make a big difference for our destiny. There's an emotional side to us that can ward off anything that is not good for us, so give our mind some exercise to wake up to this energy. The Moon in Sagittarius is squaring Neptune / Chiron in Pisces, and it's good to express our generosity and determination to get along with all we come into contact with. If we are involved in a group of some kind, we will find it more fulfilling than before. As always with a square aspect, we could be faced with a few frustrations along the way, but we will know how to control our emotions and how to avoid making a big mistake. With the Moon in Sagittarius trining Uranus Rx in Aries and Jupiter Rx in Leo, embrace that free spirit and take time to really see what's happening in the world around us. There's a surge of positive energy coming our way which means a long trail of wonderful and surprising opportunities. Use our creative imagination in letting others see how they can achieve something with a happy mind. Our heart will be filled with sunlight as we follow the path of our dreams. Make your own light. Create your own path. Happy New Moon! The Sun and the Moon are conjoining together in Capricorn, marking a New Moon in the sign of the Sea Goat. With Mercury, Pluto and Venus also in the sign, we have a stellium generating a powerful new beginning. There are changes taking place all around, as we are going strong in mind and in courage. Having belief in ourselves, we feel more confident about decisions we take. The Sun, Moon and Mercury in Capricorn are forming a sextile to Neptune in Pisces, and this is a time when we can show others how we can push any negativity away to make things happen. It's great to get busy in a way that we like, especially as people get to see the way our energy carries us forward. If we have dreams that we wish to manifest, then be persistent with our vibration of allowing - it may happen sooner than we think. Pluto and Venus are closely conjoined sparking the deeper side of love and romance, and things could develop rather quickly and passionately. With Pluto involved, the feelings are natural, and there's something new we could learn about ourselves that can completely transform us. With the stellium in Capricorn squaring Uranus now direct in Aries, do not take other people's thoughtless comments to heart. Remember that change is the only constant in life, so allow our unique light to shine in spite of adversity and change. When we really put our mind to it, we can come out the other side feeling more enlightened and empowered. This marks a point of no return for the old ways. Set new intentions, keep on with the positive work, and we will work miracles in our life. I'm not crazy, I just don't give a darn! 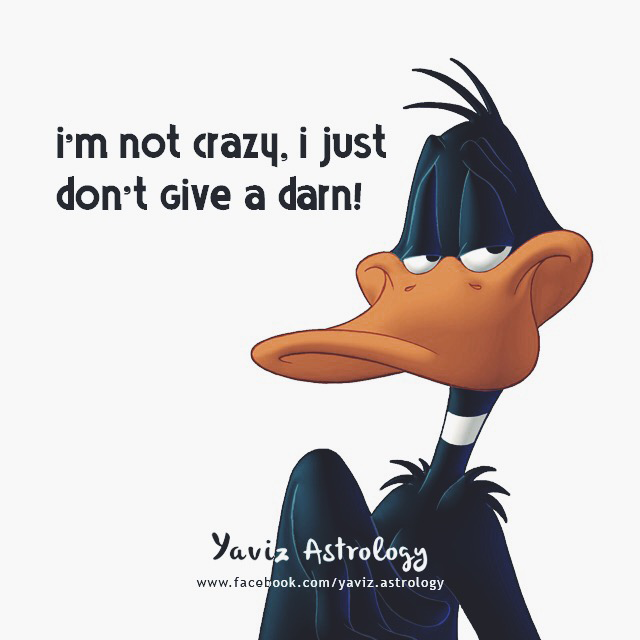 -Daffy Duck The Moon is in Aquarius along with Mars, inspiring a time of big dreams so we can soar high. We have a mind of our own, so use it to strengthen our independence. The Moon in Aquarius is forming a sextile to Saturn in Sagittarius and Uranus in Aries, and our curiosity can get us into contact with others with more experience who can help to expand our horizons. If our head has been filled with many questions in the past week, we can surprise ourselves by the progress we make in finding all the answers with our sharp thinking. We are also particularly bright, hopeful and eager to get things done at this time. With the Moon's opposition to Jupiter Rx in Leo, it's possible that others might attempt to influence us into other directions concerning work or personal life. It will be good to make our stand as we have clear ideas on what we want to achieve. Use our heart and our head in this. We can enjoy the time more by being out in the open as it will be filled with surprises and smiles. Have some fun. Mix with people who love life and love to laugh. 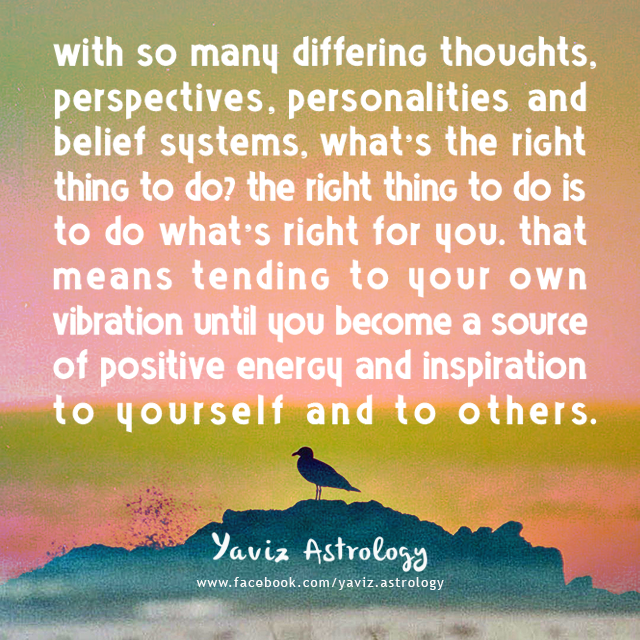 With so many differing thoughts, perspectives, personalities and belief systems, what's the right thing to do? The right thing to do is to do what's right for you. That means tending to your own vibration until you become a source of positive energy and inspiration to yourself and to others. The Moon is in Pisces joining with Neptune and Chiron, and this is a wonderful time to feel our way through. We can turn a new page while feeling inspired by a new hope or love. The Pisces Moon is forming a square to Saturn in Sagittarius, and we may trust everybody else but ourselves. We are the only one who knows everything about us, no one else can give us our answers. Take the time to listen to our inner voice, and we will finally recognize our true needs. With the sextile to the Sun, Pluto, Mercury and Venus in Capricorn, our friendliness is what gets us to communicate easily with other people. We can enjoy being a part of a team, maybe somewhere we can improve on our skills and enjoy doing what we love to do. A good relationship can take a turn for the better and really blossom at this time. There is magic in the air for an energy of romance. The more we give, the more we will receive. There will be a positive purpose to what we're doing and the possibilities are growing. Things start to go well as we keep up with the positive approach and optimism. Welcome the flow. 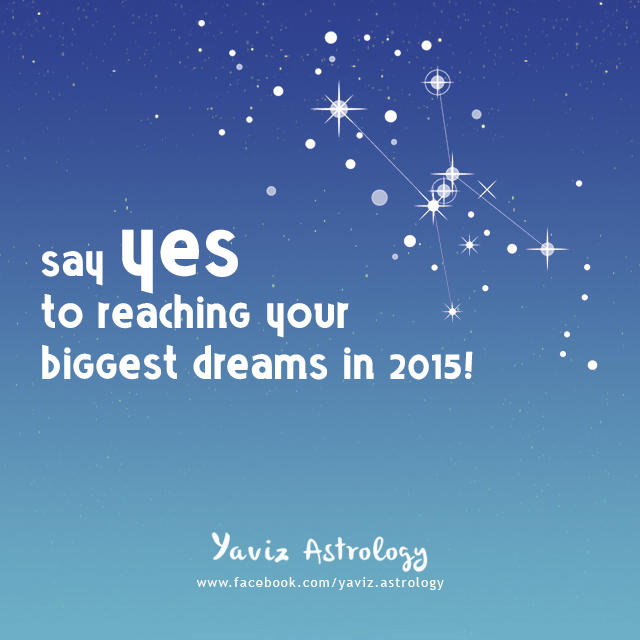 Say YES to reaching your biggest dreams in 2015! The Moon is back in fire starter Aries joining with Uranus - which turned direct last week after months of retrograde, and we can be astonished by what we can produce with our creative mood and innovative ideas. This is a good time to think of the life that we want for ourselves and to take action to make it into reality. The Aries Moon is forming a trine to Saturn in Sagittarius and a sextile to Mars in Aquarius, and the main focus during this period will be on having fun. Our energy level is good, and we should be able to have a good time under any circumstances. Success will also depend on our leadership skills, so get the feel of what's happening around us to help us stay focused on what's really important. With the square to the Sun, Pluto, Mercury and Venus in Capricorn, avoid impatience and haste because we might come to regret the decisions in the future. Try to be more outgoing this week and taking it easy. Talk to those we care about, sharing a laugh can do wonders for the spirit. Issues related to love can be extra mysterious at the moment, but we'll know what to do and what to say at the right moment. The trine to Jupiter Rx in Leo later on can spark our sunny side and positive thinking to carry more optimism within us. Our fun thoughts and ideas should be enough to get the ball rolling. Follow this road of exploration. 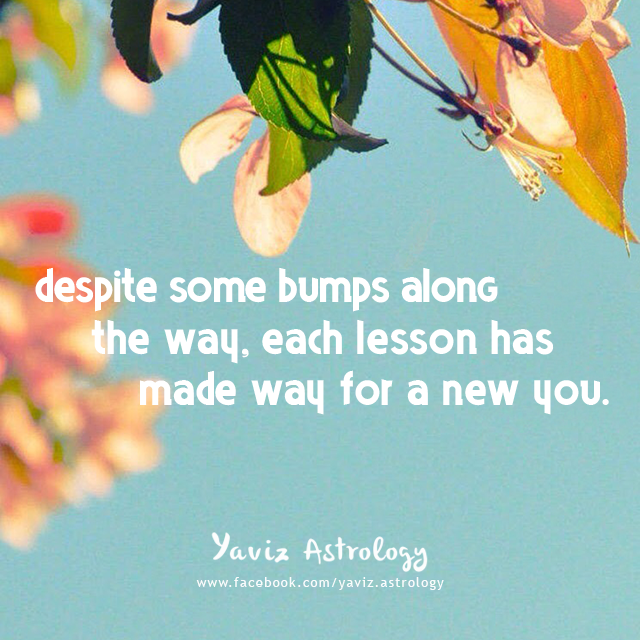 Despite some bumps along the way, each lesson has made way for a new you. We end the year and begin another with the Moon in Taurus. 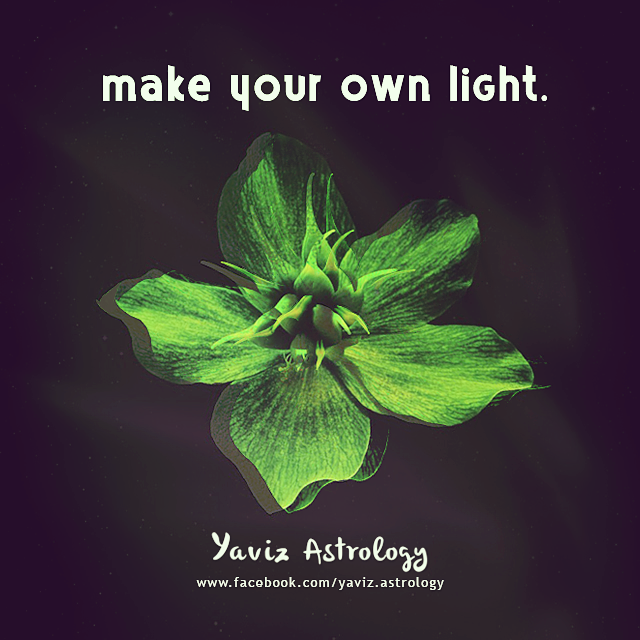 Taurus is a sign ruled by Venus, and rules the Second House in Astrology. Venus in Astrology represents love, romance, money, and anything we find enjoyable. The Second House - also referred to as the House of Possessions, is all to do with our possessions and our sense of security in life. With the Moon in Taurus sextiling Neptune in Pisces, look to our inner self to see the strong person we are. We'll be charged up with all the creativity required to make great advances in our personal projects. Don't hesitate to work on those dreams as we are more positive than ever to make a change where necessary. The Taurus Moon will make a trine to the Sun, Pluto, Mercury and Venus in Capricorn, and thoughts about the future could fill our mind. This is a good time to plan things for the new year, so take positive steps forward that could change our future. We also want to live up to high standards in our work and personal life, and we enjoy being expressive in all we do. With the Moon's square to Mars in Aquarius and Jupiter Rx in Leo, it will be good to escape from our usual routine by going on a short vacation or make a trip somewhere - a place where we can break away from all the daily stress. Our time will be more peaceful if we just shut our mind off to anyone's negativity. This is a wonderful time full of new discoveries. Positive forces are at work and this could change our pattern for the whole year. Enjoy being sociable. A weekend of celebration with loved ones and friends will be lively and full of promise. 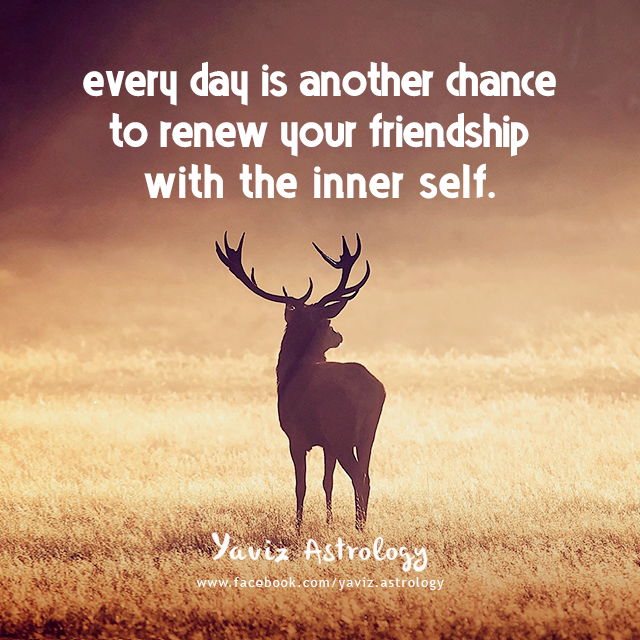 Every day is another chance to renew your friendship with the inner self. Often, it can be easy to lose ourselves when we are around other people. But how does it feel when we suddenly find ourselves alone? Can we enjoy our alone moments for what they truly are? Especially at times when we really want to be around people, but there's no one around. Yes we can. For peace is always the core of our being, and our soul is always speaking to us - guiding us to find inspiration in every moment. The Moon in Gemini is squaring Neptune in Pisces, and we need to take certain steps before our prayers can be fully answered. Now is the perfect time to put energy, action and intention into manifesting what we desire. Once we take that first step, the Universe then gives us additional help. Know that any blocks we encountered in the past were because the timing wasn't yet right. The Gemini Moon will form a sextile to Uranus in Aries and Jupiter Rx in Leo, and we can charm our way through anything. We enjoy casual and more relaxed conversations with others that can contribute to our happiness and well-being. Try to loosen up, as we may be the one to show others how to really have a good time. With the Moon's trine to Mars in Aquarius, we'll be supported as we move forward to put our ideas into action - as long as we remember to check in with our inner self regularly for continued guidance. Take the time to meditate upon our heart's desires, and know that we deserve the best, as we all do. Use affirmations and visualizations to help with the manifesting process, and release any guilt or fear regarding asking for what we want. Trust our instincts, as we're about to discover some paths definitely worth taking.